Citation Information: JCI Insight. 2019;4(4):e126047. https://doi.org/10.1172/jci.insight.126047. Antibodies and cytotoxic T cells represent 2 arms of host defense against pathogens. We hypothesized that vaccines that induce both high-magnitude CD8+ T cell responses and antibody responses might confer enhanced protection against HIV. To test this hypothesis, we immunized 3 groups of nonhuman primates: (a) Group 1, which includes sequential immunization regimen involving heterologous viral vectors (HVVs) comprising vesicular stomatitis virus, vaccinia virus, and adenovirus serotype 5–expressing SIVmac239 Gag; (b) Group 2, which includes immunization with a clade C HIV-1 envelope (Env) gp140 protein adjuvanted with nanoparticles containing a TLR7/8 agonist (3M-052); and (c) Group 3, which includes a combination of both regimens. Immunization with HVVs induced very high–magnitude Gag-specific CD8+ T cell responses in blood and tissue-resident CD8+ memory T cells in vaginal mucosa. Immunization with 3M-052 adjuvanted Env protein induced robust and persistent antibody responses and long-lasting innate responses. Despite similar antibody titers in Groups 2 and 3, there was enhanced protection in the younger animals in Group 3, against intravaginal infection with a heterologous SHIV strain. This protection correlated with the magnitude of the serum and vaginal Env-specific antibody titers on the day of challenge. Thus, vaccination strategies that induce both CD8+ T cell and antibody responses can confer enhanced protection against infection. Vaccination that induces both antibody and tissue-resident CD8+ T cell responses confer enhanced protection against mucosal SHIV infection in young macaques. (A) Vaccination groups and immunogens: 65 female RMs of ages 5–15 years were divided into 3 experimental groups. 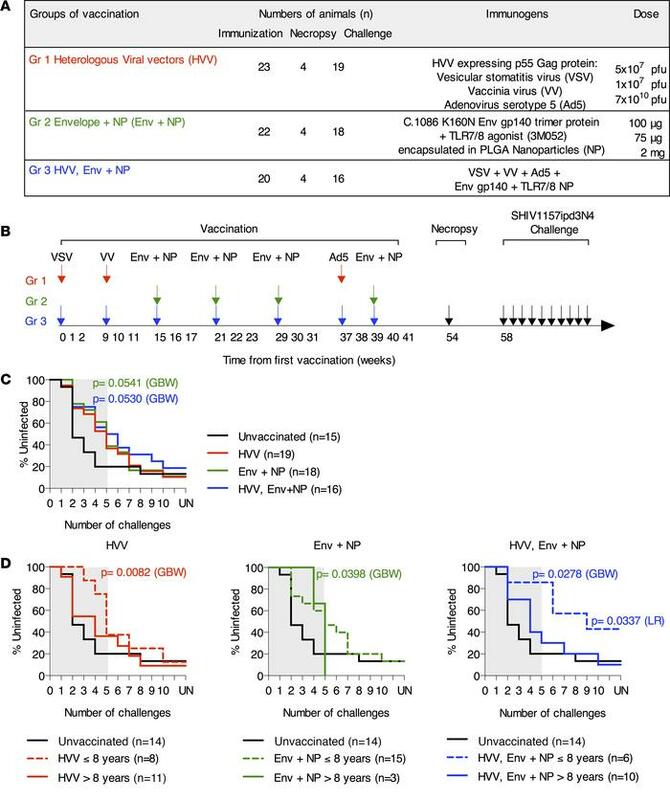 Animals in Group 1 were sequentially immunized with replication competent recombinant heterologous viral vectors (HVV) VSV, VV, and Ad5 each encoding SIVmac239 Gag protein. Animals in Group 2 were immunized with recombinant gp140 C.1086 K160N trimeric Env protein adjuvanted with the TLR7/8 agonist, 3M-052, encapsulated in PLGA nanoparticles (NP). Group 3 animals received immunizations with both HVV and adjuvanted Env protein, according to schedule indicated. (B) Study overview. Animals were bled 4 weeks before primary immunization for baseline analysis. Immunization was performed with each viral vector or adjuvanted Env protein on the weeks indicated by arrows. At week 54, 4 animals in each group were sacrificed to evaluate prechallenge immune responses. Starting at week 58, the remaining animals were challenged weekly by the intravaginal route a total of 10 times or until infected with SHIV-1157ipd3N4, which expresses a heterologous Clade C Env. (C) Rate of infection acquisition in all vaccinated animals in comparison with the 15 unvaccinated controls. The gray section highlights SHIV acquisition up to 5 challenges. (D) Acquisition of infection in animals <8 years old (dotted line) and animals >8 years old (solid line). When compared with young unvaccinated controls, younger animals (<8 years) given the HVV, Env + NP vaccine regimen were found to be significantly protected using the Mantel-Cox Log-rank test or Gehan-Breslow Wilcoxon test for early time points.